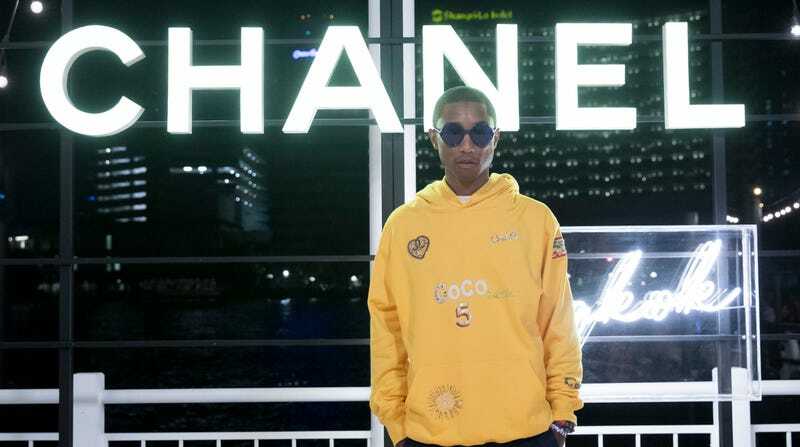 Will Chanel&#39;s 1st Ever Collab Be Pharrell&#39;s Next Big Hit? #ChanelPharrell: Will Chanel's 1st Ever Collab Be Pharrell's Next Big Hit? After months of teasing and a sneak peek worn by Pharrell himself to the Chanel Cruise show last October, the musician’s capsule collection with the French luxury house—the first collaboration in its history— is ready to go live this week in Seoul, Korea, with a global release on April 4. In a behind-the-scenes video for British Vogue predating the February death of creative director Karl Lagerfeld, Williams explained the inspiration behind the collection and campaign, which draws heavily from his love of streetwear and belief in gender fluidity and individuality, as well as his longtime fandom of the brand. Motifs throughout the collection include motocross, anime, and schoolyard-bright colors, paired with classic Chanel details like chains, pearls, the number 5 and, of course, the interlocking C’s we all instantly identify with the label. The late Karl Lagerfeld aptly named the collaboration “Chanel Pharrell,” which appears embroidered on clothing, encrusted on jewelry, shoes and more, along with handwritten notes by Williams himself. The Glow Up tip: You can see the entire behind-the-scenes video of the making of Chanel Pharrell at British Vogue.